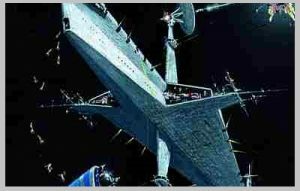 The first Imperial Cruiser was designed as an ominous space ship that housed weapons and smaller space craft in on-board hangers. Colin collaborated closely with George Lucas in order to achieve George’s vision of the magnitude of the Star Destroyer. The scale of the Star Destroyer was ascertained when Colin asked George qualifying questions such as “How large should this ship be?” Is it bigger than Burbank?” Ultimately, Colin came up with the design when he started to explore a larger ship that could destroy worlds but not be as deadly as the Death Star. The Imperial Cruiser was armed with both local and highly destructive long range weapons that were used in battle against the rebels. The Imperial Cruiser depicted in the original drawings was later modified into the form used in the actual “Star Wars” movie.